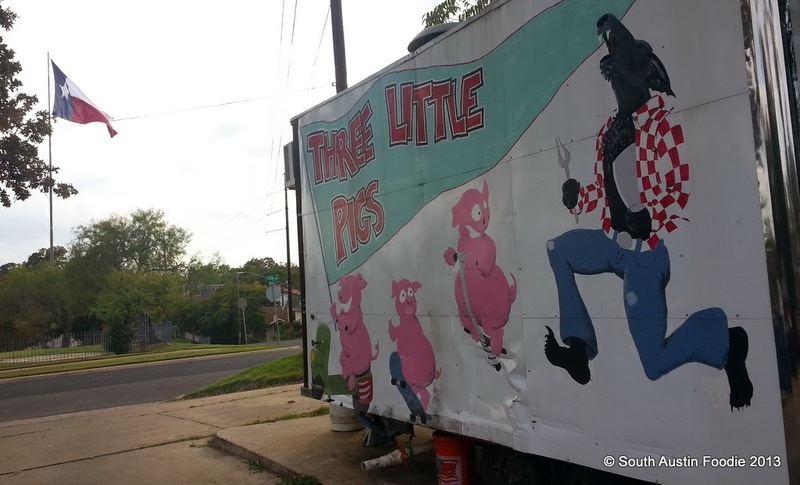 I have been wanting to go to the Three Little Pigs trailer for over 2 years. Somehow other things always come up, and I never made it over to East 11th and Rosewood, where it's parked behind East End Wines, on the north side of the Texas State Cemetery. 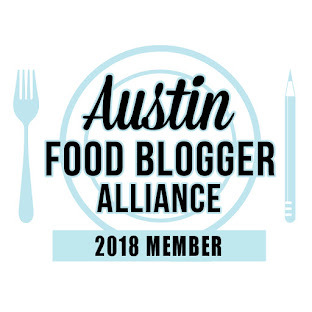 Then on a recent Saturday, I got a message from friend and blogger Mad Betty asking her if I wanted to go with her that evening, as she had set up an interview with owner Raymond Tatum for a future edition of Austin Foodstyle magazine. I ditched work a little early and jumped at the chance! Since we were there early, they weren't too busy, and Raymond came and sat with us for a little while. 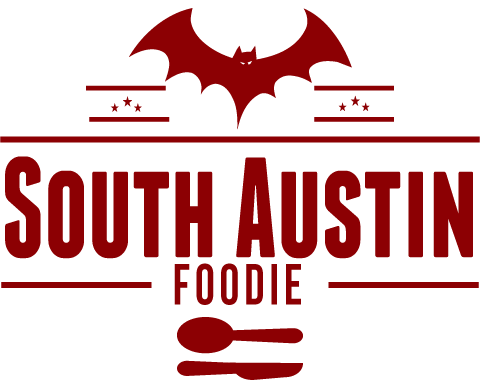 He's a native Austinite, and was at the helm of Jeffery's during it's late 1980s/early 90s heydays. He thinks pigs are the perfect animal, because you can use every part of them to cook with; I think he's done "nose to tail" cooking before it was *cool*. He's done some dishes at the trailer like pig tripe, which he knows doesn't have mass appeal, but it's something he loves, even though it takes days to rinse and prepare the tripe. You can feel the passion for the food oozing from him. He also draws a lot from Asian cuisines, as was evidenced by the three dishes he made for us which were on that night's specials. 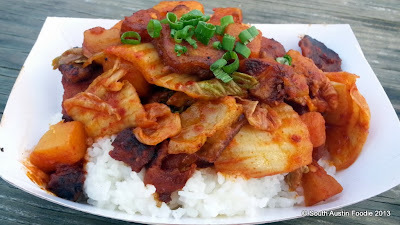 First was the pork belly with kim chi. Bite-sized pieces of pork belly that have been cooked so nicely, each piece was good and crispy, and the kim chi had a nice kick. His Korean friends have taught him which is the best kim chi to buy at the Korean grocery store on North Lamar and Justin Lane. For people who may not like pork belly because of its fattiness, this is a great way to try it. 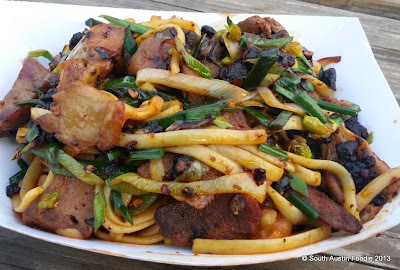 Next was pork tongue with noodles, leeks, and a spicy black bean sauce. I had never had pork tongue before, and it was really good! I doubt I would have known I was eating tongue, because it had a good texture, kind of crispy, but not tough. The black bean sauce really added a nice savory dimension to the dish. 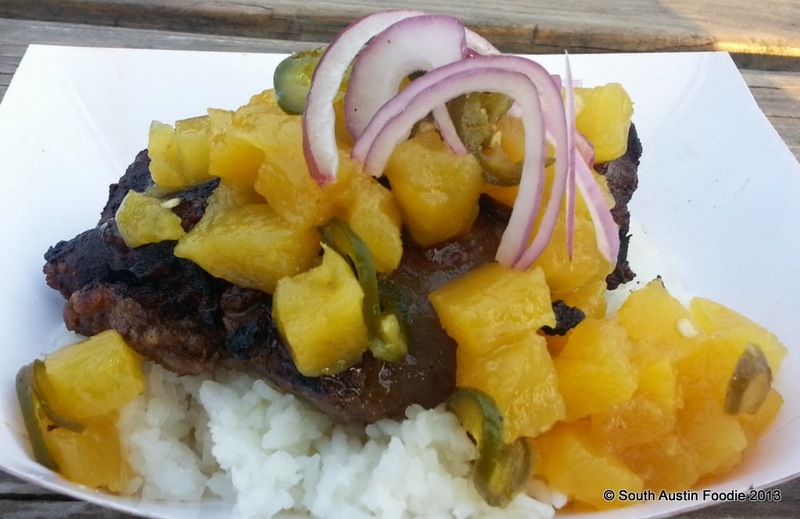 And braised pig cheeks with pineapple jalapeno chutney. It's a very close call, but I think this was my favorite, in part because of my love for sweet and savory combinations. The cheeks were really meaty and incredibly tender, the plastic fork just sliced right through them. 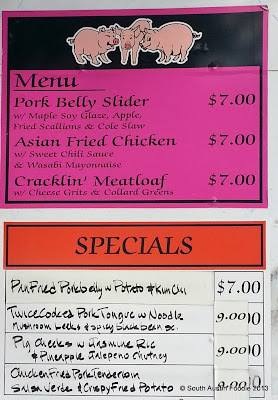 Here's a shot of the menu. They've got their Twitter and Facebook pages linked to their main website, and they're good about updating them with the daily specials. I aim to get back there soon. 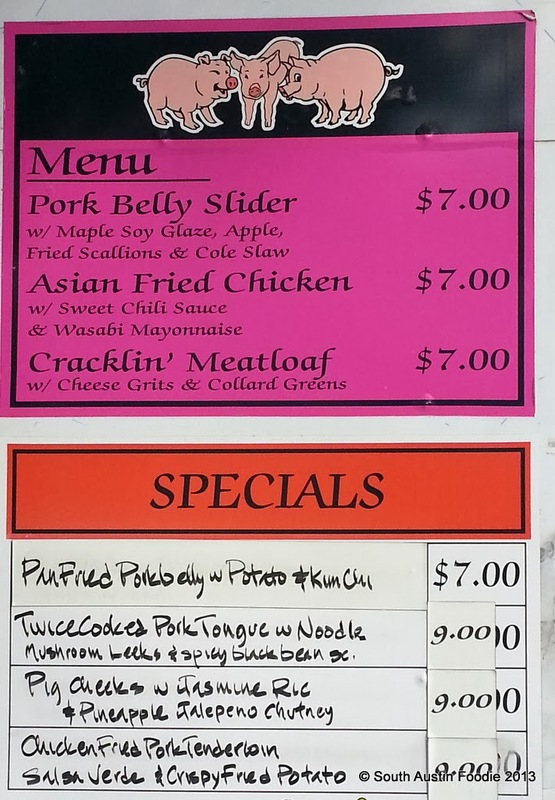 Even the regular menu items sound fantastic. Good people, good food. New favorite trailer, hands down. Oh my! You really went whole hog... looking forward to trying it. He does great work! I should also add, the place was a favorite of Jill of Austin Slow Burn. Fantastic write-up! Now that I've submitted my article I want to head back and grab dinner again. I'm in full agreement. This is my new favorite as well. Raymond is so talented. Thanks again for letting me tag along! Can't wait to see your article in print! Yay! Glad ya'll finally got to check this one out. The wine store is fantastic as well. Lots of great buys, just ask them for a recommendation. I like to order from the trailer then grab a bottle while I am waiting. Two of my faves at Pigs are the Asian Wings and when he has some venison sausage, he serve it with Brussels sprouts and jasmine rice. So simple but so good. Can't wait to go back to Three Little Pigs -- maybe we should do a girls night there! While I haven't been in East End Wines in ages, it's owned by a former co-worker, yes, good people! :) Those wings sound delish!